The Griffin/Spalding Bike/Ped Committee (BPC) and Griffin Bicycle Coalition (GBC) will on March 26 sponsor an inaugural Griffin Bikes to City Hall event to raise support for the development of a local bicycle network of both on-road and off-road facilities, multi-use trails and sidewalks that improve cycling and walking connections In and around neighborhoods, commercial and employment centers, schools and other major destinations. The bike ride will have group ride leaders from the BPC and secured parking for bikes at city hall. Rides will depart from four locations at 5:15 p.m. – First United Methodist Church, Griffin High School, the University of Georgia-Griffin Campus and Ambucs Park – so as to arrive just prior to the 6 p.m. Griffin Board of Commissioners meeting, which we will join. All bike enthusiasts are encouraged to join the ride that will culminate in the presentation of a resolution from city officials to support the development of a local bike network and highlight the importance of funding for pedestrian and bicycle infrastructure and other alternative forms of transportation. Transportation solutions should be about providing options for people. Most car trips are very short – running errands and the like are often less than two miles – and many young people today don’t even want to get into a car. Communities that can offer alternatives to driving like cycling, walking and transit attract young people and families, and can help reduce congestion, improve our air quality and encourage a healthy lifestyle. They also offer healthy options for seniors too. The event is modeled after, and held the same day as, Georgia Rides to the Capitol (GRTC), an annual state sponsored event. During the 2012 GRTC event, an estimated 1,200 bicycle riders and more than 30 Atlanta metro-area mayors and city council members converged on the steps of the state Capitol to call for improved bicycle and pedestrian networks and a statewide Complete Streets policy. Georgia Department of Transportation (DOT) officials who attended GRTC heard the Complete Streets rally call and subsequently convened and coordinated a Complete Streets policy task force, working with stakeholder groups like Georgia Bikes to address specific components of the policy. DOT, unanimously adopted a resolution in support of the agency’s newly unveiled Complete Streets design policy. 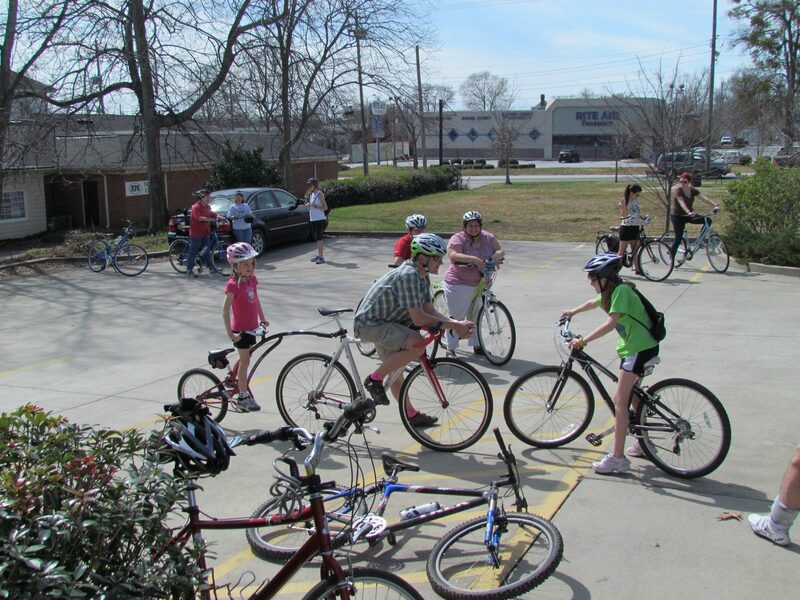 “This statewide Complete Streets policy ensures that all future roadway projects in Georgia that are funded with state or federal dollars must address the safety needs of all road users, including pedestrians and people who bike,” said Georgia Bikes Executive Director Brent Buice. During the 2013 Georgia Rides to the Capitol event, participants will call on state elected and DOT leaders to implement the statewide Complete Streets policy using federal funds set aside for bicycle and pedestrian projects; protect the legal rights of cyclists; and dedicate a fair share of funding for bicycle and pedestrian facilities and infrastructure. It is the hope of this committee that the Griffin Bikes to City Hall event will raise awareness and grow over the coming years, and that other communities who are located too far from Atlanta will organize events in their cities to echo the cry at the Capitol that our citizens want alternatives in transportation that encourage a healthier lifestyle and a reduced dependency on automobiles for transportation. The bike ride is free and open to the public. For route maps, group ride leaders or additional information, visit the Griffin Bicycle Coalition’s Facebook Page at https://www.facebook.com/griffinbicyclecoalition.v For additional information on the main Atlanta event, visit http://www.GeorgiaRidesToTheCapitol.org.